I was cleaning up for the holidays and found some stuff we brought back from our trip to the National that we never unpacked. I found this in the bottom of a bag. I have no recollection of getting this and have no idea what it is. 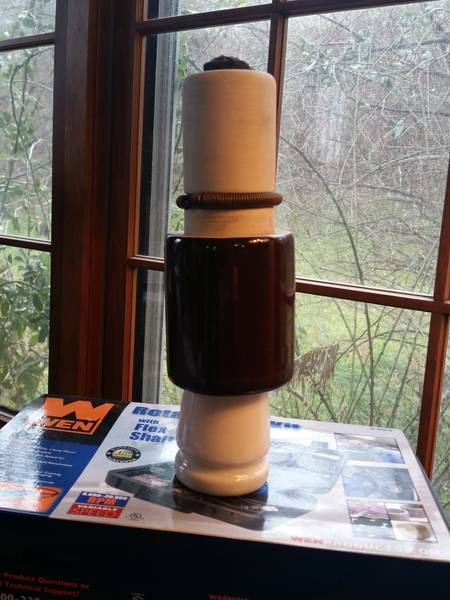 It is a white conical piece attached to a brown cylindrical piece, and it seems to have a brass rod or tube in the bottom (white piece) and a wire coming out of the top. Can anyone tell me what this was part of? I would have said some type of lightning arrester if it wasn't for the white piece on the bottom. Dave Dahle informed me that it's a bushing off a Westinghouse distribution transformer and he gave it to me at the National! I have to put a label on it now so that I don't forget again.